Current prize winners of the Worshipful Company of Musicians, The Ducasse Trio bring to the Petworth Festival a reputation as a passionate and vibrant young ensemble. Formed in 2011, the trio consists Charlotte Maclet – violin; William Duncombe – clarinet; and Fiachra Garvey – piano. “The name comes from Isidore Lucien Ducasse who is a French writer,” explains Charlotte. “He is more famous as the Comte de Lautréamont. For us, it is just a reference to his crazy world and his beautiful world. I gave the book to William from the trio, and he was really shocked. It is quite a shocking book! And it is full of amazing images that seem to go pretty well with our visual world. “Will and Fiachra knew each other from Paris, and I come from Paris and I met them in London! They had been playing together for a while, and then we decided to get together to play in about 2010 or 2011 because we specially wanted to play the repertoire we were interested in. The trio has recently held a fundraising concert towards their plans to go into the recording studio for their debut CD. 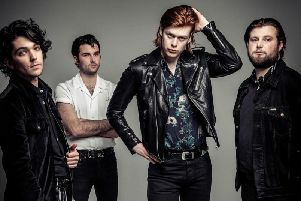 They are needing to find something in the order of £5,000; if things go well, they could be recording in the winter with a view to a CD release next spring. For the Petworth Festival, they play Khachaturian – Trio for clarinet, violin and piano; Poulenc – L’Invitation au Château; Stravinsky – A Soldier’s Tale; and Shostakovich - Five Pieces. The trio perform for the Petworth Festival on Thursday, July 28 in the Leconfield Hall Petworth. The recital starts at 2pm and ends approx 1pm (no interval). Also coming up at the Petworth Festival is The Ferio Saxophone Quartet, Wednesday, July 27 at Champs Hill, Coldwaltham, Pulborough, starting at 7.30pm.